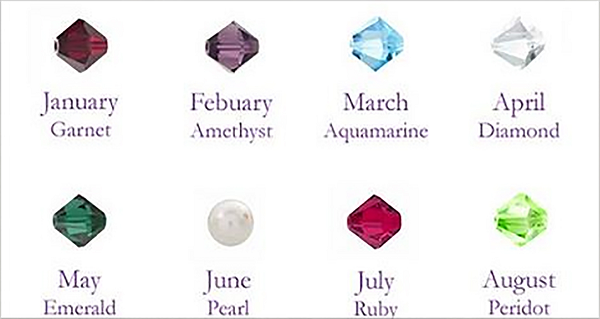 Fun & Inspiration What Does Your Birthstone Say About You? Remember how when you were a kid, everything seemed so magical? You believed in magic and Fairytales. Father Christmas existed and so did the Easter Bunny. For thousands of years, gemstones have been associated with magic and mystery. The ancient Indians believed that different stones had different healing powers. Others believed that each month of the year was represented by its own stone. Below we have listed the months of the year and the stone each month is linked to. Find your birth month and read what it says about you. § January : Garnet can be found in all colours apart from blue. It has been said that it could help to prevent snake bites and nightmares. It could also provide directional guidance in the darkness. If you wear the stone, you could see an increase in your self image, will power and energy levels. It could also help nervous people feel more relaxed. Faith, love and constancy are all attributed to Garnet. § February : Purple amethyst. This stone is associated with peace. temperance, serenity and royalty. If you wear the stone you could be protected from the darkness. The Pope has always been known to wear an amethyst ring. § March : Pale blue aquamarine gemstones These and the bloodstone are all associated with good health. They are also connected with youth, love and hope. Wearing this gem may give new spark to married love, build your courage and improve your overall happiness. § April : Diamonds Famously known as a girls best friend. Diamonds come in several colours. They share associations with eternal love and invincibility. It was also once thought that they could ward off insanity. § May : Green emeralds. These gorgeous green stones speak of health, faithfulness, fertility and improved eyesight. § June : The cool, milky beauty of pearls or moonstones. These stones suggest chastity, modesty and stable marriage relationships. These gems are available in sophisticated black, grey, chocolate and the familiar creamy-white colours. § July : Red rubies. These gem stones are tokens of harmony and peace. Their beauty speaks of strength and nobility of character. Wearers may attract both good luck and good friends. § August : Light green peridot has its own charming sparkle. Tradition says you will be able to successfully ward off evil, enchantments and depression if you wear or carry peridot. § October : Opals These exotic stones along with tourmaline are linked with hope, innocence and creativity. They also protect the wearer from bad or mal-intended people. § November : Yellow topaz and citrine are associated with strength and healing for both body and mind. They offer protection to travellers and support good mental health. § December : Tanzanite, Turquoise, blue topaz and tanzanite. These stones are linked with a happy life that will be filled with good fortunes. The stones could also prevent or cure headaches. In ancient times, people believed that turquoise would change colour when the wearer was not well or in danger. Be sure to SHARE this with your friends so they too can see what their gem stone says about them.